Here a story that I never imagined. Thanks to the omnipresent quadcopter, we are catching more and more “unique” situations on film. From the planned to the unplanned, you have to admit, drones have been collecting some never seen before events. Where is the last place you’d expect someone to lay out for a tan? At the top of a giant wind turbine. Thanks to Kevin Miller for capturing this awesome scene. 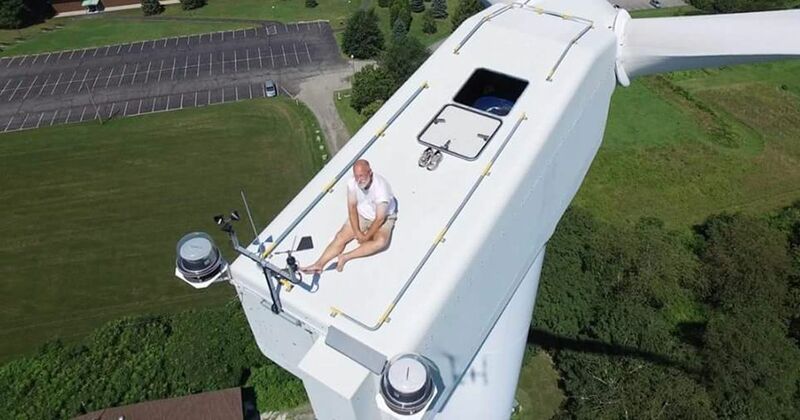 A drone pilot taking a look at a giant wind turbine was startled to find a man sunbathing on the top of it. Kevin Miller flew the drone all the way up the 200ft turbine to find the mystery man flat on his back catching some rays. Woken from his nap by the noise of the drone, he sits up, gives a wave, and looks rather nonplussed as the drone moves in further for a good look.